Cheetos have appeared in many flavors and forms since they were introduced in 1948 (there was even a Cheetos cheese-flavored lip balm!). But not all have endured. 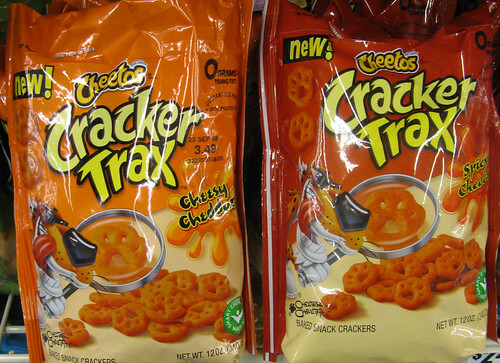 Here are a few Cheetos snacks that you'll no longer find in U.S. stores. Most food brands have experimented with pizza-flavored snacks, because pizza is the perfect food. 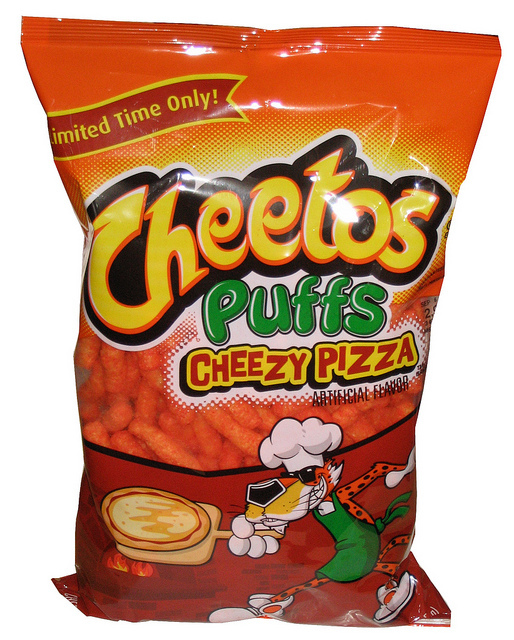 Cheetos joined the pizza party around 2001 and left it in 2006. "The original Cheetos flavor wasn’t really detectable," an anonymous person wrote on Phood, a community food review blog. "Cheese pizza was, though. The flavoring tasted almost exactly like the filling flavor of Cheese Pizza Combos." Another member of the blog agreed, writing, "I love them with all of my heart. Probably the best chip I've had in a long time." These cat paw-shaped puffs, introduced in 1990, lasted a mere three years as solo snacks, but they can still be found in Cheetos Cracker Trax and Cheetos White Cheddar Bag of Bones. In the Facebook group Dear Cheetos: Bring back Paws/Checkers/X's and O's, a woman posted this email response from PepsiCo after asking them to bring Cheetos Paws back: "There are many reasons why a product may be discontinued, but it is usually because there aren't enough consumers like you buying it. Sometimes stores stop carrying slower-selling items to make room for other products." The company also apologized and sent the fan a coupon in the mail. As the name suggests, these puffs came in X and O shapes. They were introduced in 1999, but discontinued the next year. 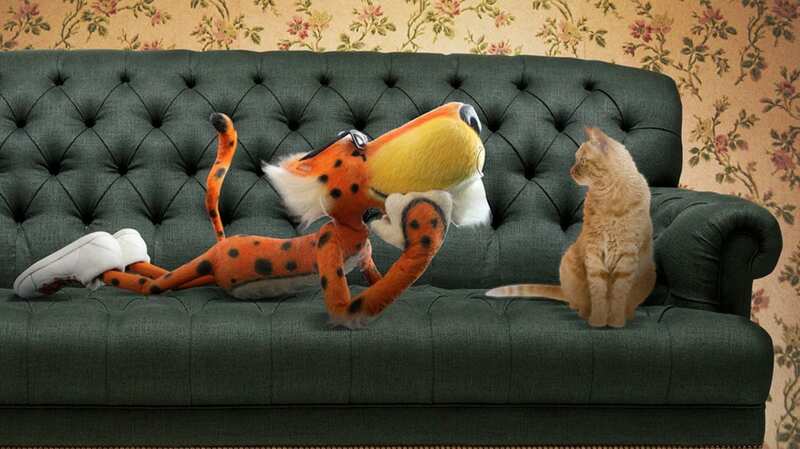 One memorable commercial for the product featured Chester Cheetah on a game show. The mascot was distracted by a child eating the snack, but luckily all of the answers to the trivia questions were “X’s and O’s”; the grand prize, naturally, was a convertible full of the puffs. The snack still has fans: One Facebook group has 801 members who want X’s and O’s and Cheetos Paws to make a comeback. Launched in 1995 and gone by 1998, these waffle-shaped Cheetos are the topic of random threads everywhere from bodybuilding forums to subreddits that focus on nostalgia. "I have spent at least a sum total of 45 minutes today thinking about the Checkers and how bad I want them," one Cheesy Checkers fan wrote in a "bring back" Facebook group in 2010. The same year that Cheetos Cheesy Checkers were discontinued, Zig Zags were introduced. They were similar to the original crunchies in texture, but more closely resembled cheese-covered crinkle cut fries. The jagged snack was around until 2002, when Cheetos Twisted was born. Thicker than the average puffs and made in spiral shapes, Cheetos Twisted existed from 2002 to 2012 before quietly disappearing. A fan inquired about the snack in a 2013 post to the Frito-Lay Facebook page, and the company's social media team confirmed the discontinuation, writing, "We know it's a bummer, but we'll be sure to pass your note on to our Cheetos team so they know they have fans who miss the snack. Thanks!" These Cheetos treats—which some have described as Flamin' Hot Cheetos without the heat—haven't been available in the U.S. since the late 1990s, but fans consistently post messages to the Frito-Lay Facebook page to request that the flavor make a comeback in the States. This chip- and dip-inspired snack was enjoyed by many around 2012, but then it vanished. When a fan asked Frito-Lay on Facebook if the flavor had been discontinued in 2012, the brand responded that they were still available and directed the hungry consumer to their snack finder tool online, but PepsiCo confirmed to mental_floss via email that the snack is no longer available here in the United States. That hasn't stopped fans from trying to bring it back. Someone started a Change.org petition last year to have Frito-Lay bring it back, but there weren't enough signatures and the petition was closed. Introduced around 2011, PepsiCo confirmed to mental_floss that Honey BBQ Cheetos Puffs are “not currently in market in the U.S.” Fans of the snack will have to find the Honey BBQ flavor in other Frito-Lay products, including Lay’s potato chips and Fritos Flavor Twists.